To check the status of an order, login to your account. Click "Order History/Check Order Status.” Here you will be able to view your orders and check the status of any order placed. If you don’t have an account, you can check on the status of order by going to the CST home page and clicking “Order Tracking” at the top. Type in your order number and email address and your tracking information will be displayed. 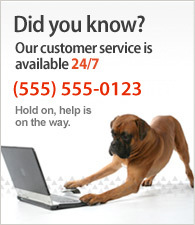 To cancel an order, contact our customer service department at 1-800-777-3444. Give them your order information and they will take care of it for you. In the event the order has already shipped, but you no longer want the item, fill out the return form provided in your shipment box when the item arrives and return the order to CST. We will be happy to issue you a full refund. In the event an item you ordered is not immediately available for shipment, CST customer service will notify you via email or phone within 2 business days. We always make every effort to ship your order complete. Sometimes items get on extended backorder from our vendors and we have no control over this, so, CST will ship the order in 2 parts. The second item(s) shipping when the item(s) comes in, unless cancelled in the interim by the customer. We reserve the right to refuse delivery or limit quantities of any product ordered at any time. Availability of any item cannot be guaranteed until you place an order. All orders are subject to acceptance by CST. We do our best but…mistakes do happen. If a mistake has caused any incorrect price to be listed on our website, Clarke Sports Tennis reserves the right to refuse to honor any erroneously priced item on the CST website. We encourage our customers to point out any errors or mistakes they may see. We appreciate your understanding in this matter. Honesty is what we stand behind every single day at CST on every transaction. We will always treat our customers with the honesty and respect they deserve. We apologize in advance for any inconvenience an error might cause our valued customers. We will work with you to resolve the issue and make sure you have a pleasant and satisfying shopping experience. If you have any questions or issues, please don't hesitate to contact us HERE.